If you’re an advisor and you don’t have a profile already, there’s a fair chance you will before the end of next week. SmartAsset, the digital lead-generation service for advisors, is using some of its recent $28 million investment from RIA aggregator Focus Financial to build out a user-friendly directory with detailed, publicly facing profiles of all registered financial advisors in the U.S., regardless of whether they sign up for the service or not. The move is meant to complement SmartAsset’s current lead generation tool that matches advisors who have paid for the service with investors who are drawn to the website’s slate of planning calculators and interest rate data. The new directory went live Thursday afternoon with some 10,000 advisor profiles listed on the SmartAsset’s site SmartAdvisorMatch.com, all created using data from the Securities and Exchange Commission, the Financial Industry Regulatory Agency and other online resources such as advisory firm websites and LinkedIn. More profiles will roll out over the coming weeks. Carvin said they’re filling a consumer need: When prospects are considering working with an advisor, the first thing they’ll do is run a web search on the name. Until recently, he said, there has never been a good database for investors to land on with all the relevant information. In its current iteration, most of the SmartAdvisor profiles include an advisor’s name, their registrations, certifications, the firm they are affiliated with, where they are located, years of experience, regulator dings, custody partners and other general information. None of the information would be hard to find elsewhere on the internet, assuming retail investors knew where to look and had a few minutes to pull it together. SmartAsset is trying to save investors from having to do that, putting all the information on a visually engaging page. The company plans to have 50,000 advisor profiles live on its SmartAdvisor website by the end of next week and a total of 100,000 live before 2019. The ultimate goal is to have a profile for all 300,000-plus advisors registered in the U.S. If an advisor wants to make changes to their profile, they can submit additional information, such as their specialties or fee structure, free of charge. 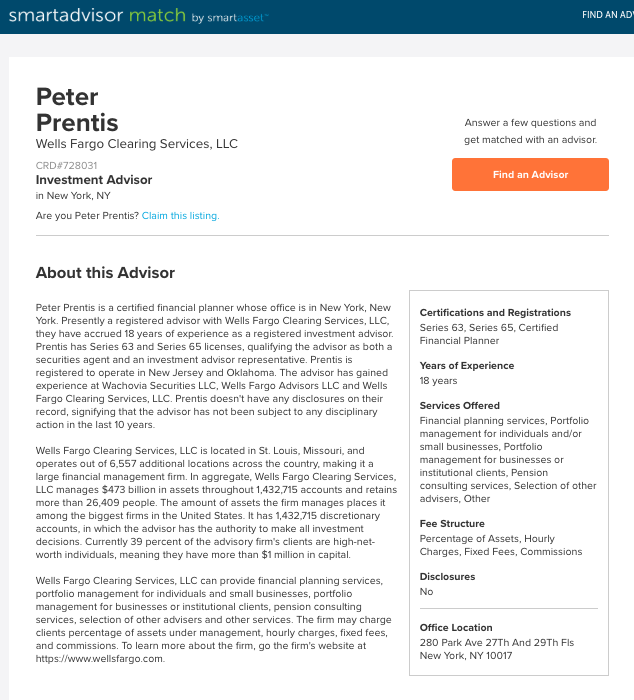 It is also free for anyone to view the advisor profiles online. If this sounds familiar, it is. Other companies have attempted to create similar databases in the past. In 2013, BrightScope created advisor profiles online, then moved to charge advisors to claim and maintain them, a policy they eventually reversed after a backlash from advisors themselves. BrightScope has since pivoted its business entirely. Several other companies have also tried to create open advisor directories that would serve as lead-generation tools for prospects, but few, if any, found success. Carvin is banking in part on the investment from Focus Financial Partners, as well as expanding the resources found on its website for consumers, who often have financial questions or are geared up to make a major financial decision. The site currently gets some 45 million unique users a month, Carvin says. SmartAsset recently expanded into another floor of its Manhattan office building and will look to move into a new headquarters next year to accommodate anticipated new hires. The company is on pace to double in size before the end of the year and plans to double again to more than 200 employees in the next 12 months, Carvin said. “The office space and ongoing hiring frenzy will help put our Series C funding capital to work growing the SmartAdvisor platform, which is and will continue to be a major channel of revenue for SmartAsset,” Carvin said in a statement about the company’s office expansion. In response to a question about its $28 million investment during its first earnings call, Focus CEO Rudy Adolf said it was a small investment for his company but made Focus one of SmartAsset’s largest shareholders. He said the investment was less about a monetary return and more about the expertise the companies can share with one another for the benefit of its advisors. “Quite frankly, we are very impressed with the initial results,” Adolf said, referring to Focus’s use of SmartAsset’s latest client-lead generation tool. That latest Series C round of capital brings the total raised by SmartAsset to more than $51 million. For its traditional lead-generation platform, financial advisors can enroll in SmartAdvisor at no cost and then choose how many pre-qualified leads they receive each month. Each lead of an investor with $1 million or more in assets costs $190. Leads for investors with between $250,000 and $1 million cost $90. In April, Carvin told Wealth.Management.com that about 30 percent of the investor leads generated have more than $1 million and the average investor has $780,000. Of all the leads, about 70 percent don’t currently have advisors.